Sweden's Volvo, the world's number two truck firm, is to buy Japan's Nissan Diesel Motor for 7.5bn Swedish kronor ($1.1bn; £548m), to expand in Asia. Volvo, which already owns 19% of Nissan Diesel, cited its hybrid technology and medium-heavy trucks as strengths. The moves follows Nissan Diesel Motor's recent profit warning after earnings fell 23% during the autumn. Volvo will assume 7.bn Swedish kronor in debt. Truck firms are increasingly looking to merge as they face cost pressures. By combining their procurement and product development, the firms could save $260m annually, said Volvo. "Nissan Diesel has a solid position in Japan and the rest of Asia, where the Volvo group foresees substantial growth potential," said Volvo chief executive Leif Johansson. Mr Johansson later said the firm had accelerated its takeover plans to prepare for tougher emissions standards, which will be introduced in Japan in 2010. "It's important to do this deal now and not in few years. We have some very important emission standards coming up and in the short term we can share R&D (research and development) on that," he added. Nissan Diesel president Iwao Nakamura also welcomed the bid saying the move would lead to lower development and purchasing costs as well as offer the potential for long-term growth. Nissan - Japan's third-largest carmaker - saw net profits drop to 104bn yen ($865m; £440m) during the October to December quarter, from 135bn a year earlier. It is majority-owned by France's Renault, which is also under cost pressures. 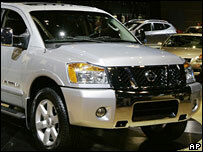 Nissan Diesel's management has agreed to the offer and Volvo says the deal should be finalised by the end of March.